Series of stories about British birds, inspired by their calls and songs. Kate Humble presents the hoopoe. Kate Humble presents the hoopoe. 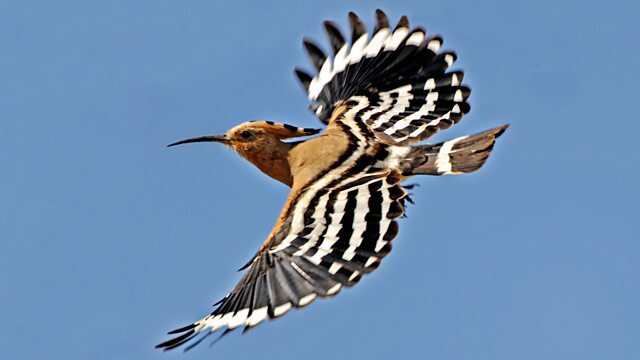 The hoopoe, a salmon-coloured bird with a long curved bill and a black-tipped crest, which it can spread like a fan when excited, is so outrageously exotic that its call reminds us of the Mediterranean. Several hoopoes arrive in the UK each spring and autumn. These are usually birds which have overshot their migration routes and almost certainly won't find a mate here, though they do breed very occasionally. Webpage image courtesy of Gordon Langsbury (rspb-images.com). A selection of the British birds that may surprise you.